It's really good to see you. Don't tell the others but you've always been my favourite. The middle of Spring is the loveliest time. The flowers are blooming everywhere, dotting the countryside with pops of colour and happiness. It always feels like such a hopeful time. Smiles are shared, weekend plans are made and trips to the seaside to soak up the sunshine aren't too far away. One of my favourite things about this time of the year is being able to open all the windows as wide as possible to let the scent of freshly cut grass & the warm breeze sweep through, while rays of warm sunshine illuminate every corner throughout the day. It's often these little things that make such a difference. The fresh air is inspiring and motivating. It's almost as though I've only just fully woken up after my extended winter hibernation and I'm ready to face all of the things I've been putting to one side. In a few days I turn twenty five. Goodness. Where does the time go? I thought I would feel a little apprehensive because twenty five sounds like an age where I'm supposed to have everything together, be settled and working towards very clear goals. And I don't really think I'm any of those things. But I think that's okay. Instead I feel incredibly appreciative. I'm happy to be here. To be able to appreciate the morning breeze that is softly brushing through my hair as I write. So many aren't so lucky. So here's to the little things. To being here. To appreciating every second. This month I would like to find a new notebook, to have somewhere to keep thoughts, ideas and memories together. I think it will be a lovely thing to be able to hold on to and look back on in a few years from now, a tangible connection to ethereal memories. I'm ready for you May, lets make twenty five the best yet. What a lovely post! I love May and it's my favourite month of the year as well! Lovely post. 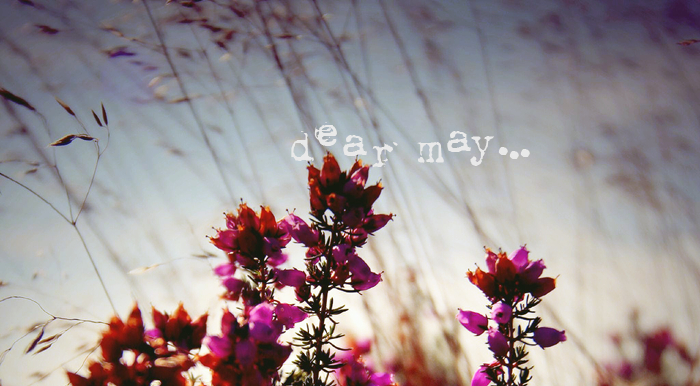 I'm trying to make May a positive one. I am ready to tackle some goals & take some time to relax. Have a wonderful Birthday Jennie! Don't feel pressured by what you should be at 25. Every person has it's own journey and we are all different individuals. Happy early birthday. Have an amazing Birthday Jennie! I hope you have a lovely day :) I find May to be one of my favourite months too it's like that beautiful warm calm of spring just before it gets hot and sticky and there are sodding bugs everywhere. Where does the time go? I know exactly what you mean; the years go by way too fast for my liking! Let's hope 25 brings you all the happiness you deserve and tons more! I remember watching Jessica Simpson's reality show a long time ago. She was devastated over turning 25 because a quarter of a century was a big deal. But, when I turned 25, I was too busy with the recession to notice. When I turned 27, I felt like I finally became an adult because I read hundreds of novels about women in their late 20s having the time of their lives. And when I turned 30, I felt like so many more opportunities opened up for me. There is so much to look forward to as you grow older!!! Happy Birthday, in advance...too! May is one of my favourites, too - the promise of summer is so motivating! Here's to hoping May is a super one! :) I hope you have a lovely birthday tomorrow. You're definitely wise beyond your years.